The Padres Wives Book Drive is currently underway. New and gently used children’s books, appropriate for kids ages five and under, are currently being accepted at the Petco Park ticket office lobby, as well as the San Diego Central Library and Warwick’s Book Store in La Jolla. Those who donate will receive a voucher for 30 percent off tickets to a Padres game of their choice. 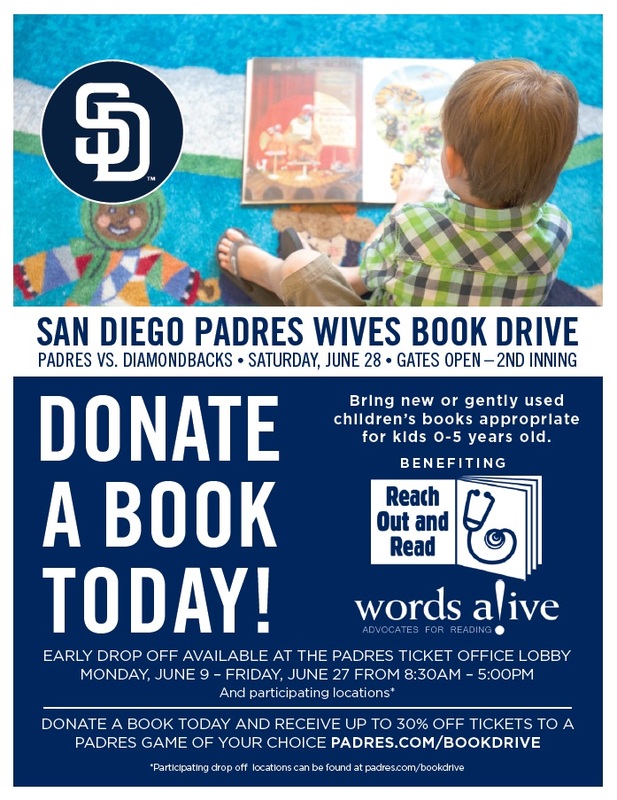 As a culmination of the Padres Wives Book Drive, on Saturday, June 28, Padres players’ wives and significant others will be collecting books at the Petco Park gates from 5:30 p.m. until the end of the second inning of the game against the Arizona Diamondbacks. All books collected will be distributed to two local non-profits: Reach Out & Read and Words Alive. Thank you for supporting childhood literacy and sharing the gift of reading!